A Delicious Melody: Personalized Charm Earring Giveaway! WINNER ANNOUNCED: Andrea. Please email me to claim your prize! Since it's already November. And since it's Tuesday night at 10:00pm. And since I haven't been blogging/making as much food lately because my hand. And since I feel sorry about that. And because I love y'all! 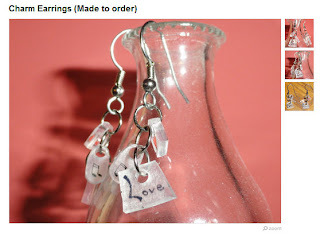 I'm giving away some of these super cute personalized earrings by JewelsNJoys Etsy Shop. And since they are made to order, you'll get a personalized pair for yourself or a loved one this holiday season! Super cool huh? 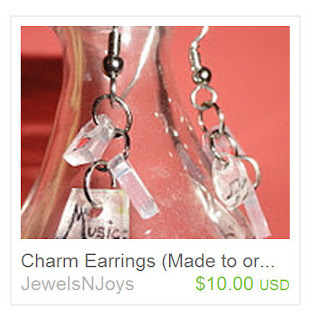 Comment on this post and you are entered in the giveaway for these cute personalized charm earrings by Jewels N Joys. Must live in the contiguous United States of America. ~"Like" A Delicious Melody on Facebook, and leave a separate comment on this post stating that. ~"Like" Jewels N Joys on Facebook, and leave a separate comment on this post stating that you did. ~Tweet or Blog about this giveaway, and leave a separate comment on this post stating that you did. They would look good on me!